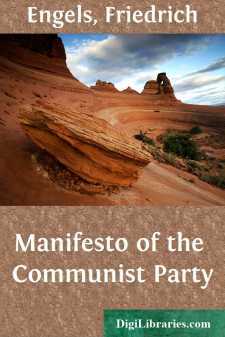 The "Manifesto" was published as the platform of the "Communist League," a workingmen's association, first exclusively German, later on international, and, under the political conditions of the Continent before 1848, unavoidably a secret society. At a Congress of the League, held in London in November, 1847, Marx and Engels were commissioned to prepare for publication a complete theoretical and practical party programme. Drawn up in German, in January, 1848, the manuscript was sent to the printer in London a few weeks before the French revolution of February 24. A French translation was brought out in Paris, shortly before the insurrection of June, 1848. The first English translation, by Miss Helen Macfarlane, appeared in George Julian Harney's "Red Republican," London, 1850. A Danish and a Polish edition had also been published. The defeat of the Parisian insurrection of June, 1848—the first great battle between Proletariat and Bourgeoisie—drove again into the background, for a time, the social and political aspirations of the European working class. Thenceforth, the struggle for supremacy was again, as it had been before the revolution of February, solely between the different sections of the propertied class; the working class was reduced to a fight for political elbow-room, and to the position of extreme wing of the Middle-class Radicals. Wherever independent proletarian movements continued to show signs of life, they were ruthlessly hunted down. Thus the Prussian police hunted out the Central Board of the Communist League, then located in Cologne. The members were arrested, and, after eighteen months' imprisonment, they were tried in October, 1852. This celebrated "Cologne Communist trial" lasted from October 4 till November 12; seven of the prisoners were sentenced to terms of imprisonment in a fortress, varying from three to six years. Immediately after the sentence the League was formally dissolved by the remaining members. As to the "Manifesto," it seemed thenceforth to be doomed to oblivion.